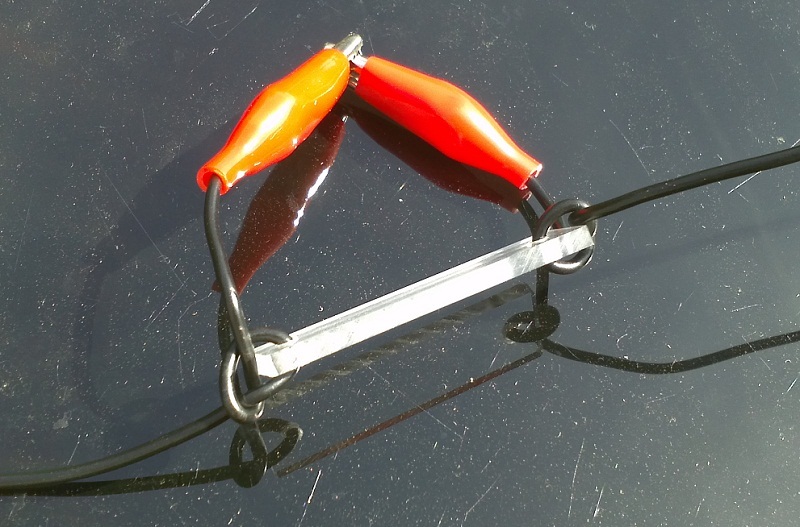 This is a really versatile aerial for “portable” operating and is also quite simple to make – It’s a 40m Inverted-V Dipole but with the wires cut at certain points with crocodile-clips soldered onto each piece of wire end. This allows the overall length of the aerial to be changed – and quickly become a 30m/20m/17m Dipole without me having to change wires or move/adjust ground-pegs or support lines. 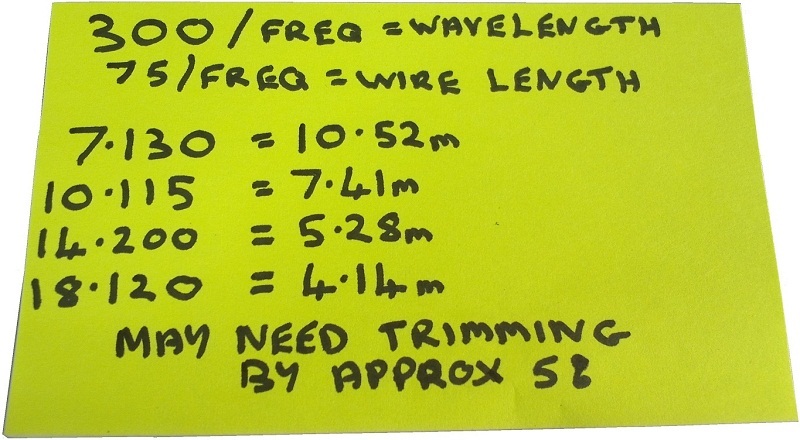 My post-it-note calculations are shown: 300/freq is the metric calculation to give you the wavelength, so 150/freq is the whole Dipole length and 75/freq is each individual wire. This is a proven formula for getting wire lengths in the ball-park of where you want them to be. 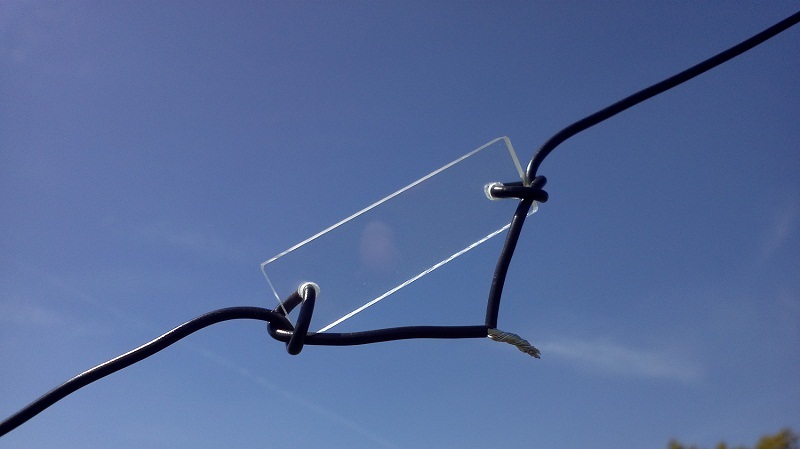 When you change the angle of wires on a Dipole to form an Inverted-V, the resonant frequency drops – and you typically end up cutting the wire 5% shorter than were it in a flat-top configuration. 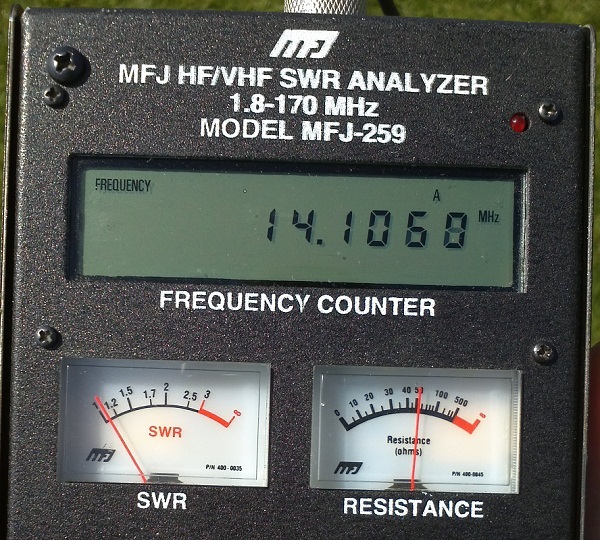 The wire used was 2.5mm 24/0.2 which I get from CPC – it’s used on a variety of my HF wires and is about £12 for a 100m reel. A very useful aspect of an Inverted-V is that it only requires 1 vertical support so is ideal for portable operations. On a conventional Inverted-V, there’s nothing to stop you adding a 2nd pair of wires for another band – this not only gives you a dual-band HF aerial but also helps support the pole if the wind picks-up. An added bonus is that you can orientate the 40m wires so that the RF lobes are North/South (perfect for inter-G) and the 20m wires East/West – just right for working into EU or over to the United States. See my Portable page for an example of this type of arrangement. It should be noted that, at ground-level, the Inverted-V is mostly omnidirectional, but it doesn’t hurt to get into the practice of knowing which direction the RF is going! For a more permanent solution, a set of red crocodile-clips were soldered onto the ends and this makes it really easy to change bands. All that’s required is to lower the sections on my 10m telescopic fishing-pole until I can reach the clips, (un)clip them and raise the pole. You could also use “bullet” style connectors – anything that makes it easy to connect and separate the wires without the ends becoming frayed or weathered. Down at the ground end, I made use of my existing “dog-bone” insulators and yellow nylon support-cord which are around 1m long. As it’s still a 40m Dipole, the geometry is no different so setting-up the whole lot is just a case of me raising the pole and walking 12 paces either side to place the ground-pegs. For other pole sizes (or other bands), your schoolboy maths and Pythagoras of Samos will tell you how far apart the ground-pegs need to be if you know the height of the feed-point and the length of the wire – and you can reverse the equation if you want to how much wire you can fit into your garden. 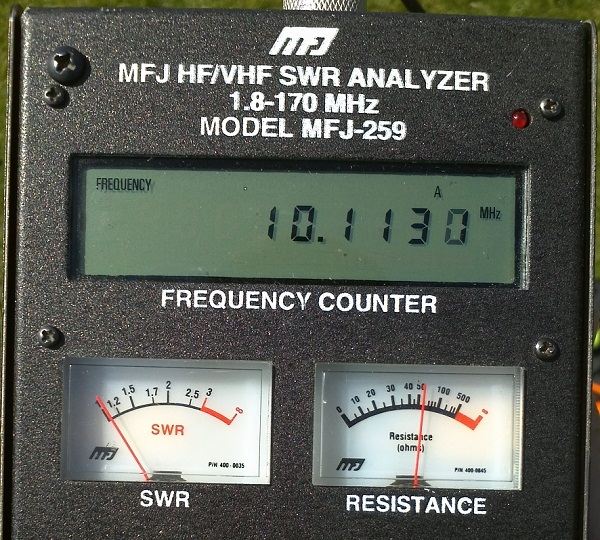 Things are much the same on 40m, too. 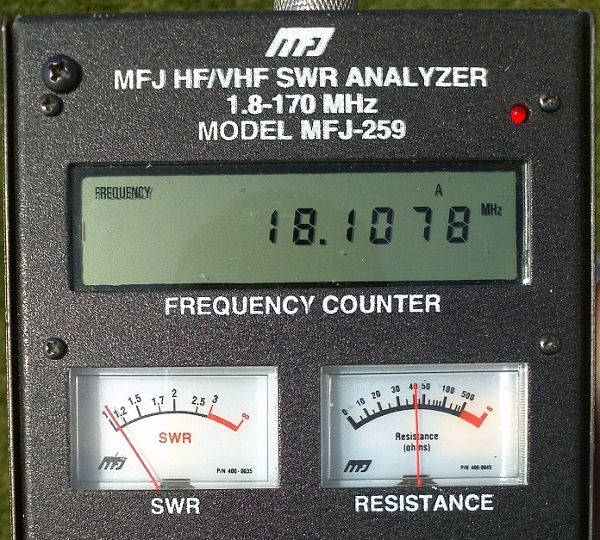 Resonance around 7.120 and as I’m mostly an SSB op when using 40m, it makes sense. So with each section tuned for operation roughly in the centre of each band, it makes life easier as you don’t need to worry about using a tuner or carrying individual wires for each band: Just Clip ‘n’ Go! Pretty much everything here belongs to M0PZT, so don’t steal it!